In the Universe of Kingdom Hearts, also called the World, there are many worlds that fall into certain realms. All of these realms are on their own plane of existence. Legend has it that long ago, there was one single world that was constantly bathed in the warmth of the light of Kingdom Hearts. In the "age of fairy tales", the world was whole and full of light, which was believed to come from Kingdom Hearts, which was protected by its counterpart, the χ-blade. Over time, people came to desire the power of Kingdom Hearts, introducing darkness into the World. In order to take control of Kingdom Hearts, many people forged Keyblades in the image of the χ-blade, and they clashed together in a far-reaching conflict that embroiled the entire World. This event became known as the Keyblade War. In the end, darkness covered the World, the χ-blade was shattered into twenty pieces, seven of light and thirteen of darkness, and the "true" Kingdom Hearts disappeared into the darkness. Prior to the release of the Heartless, the worlds were surrounded by barriers to prevent outside interference, making it impossible for different worlds to have contact. However, the arrival of the Heartless caused the barriers between the worlds to crumble and disappear, and some worlds were consumed by the eldritch horde. Gummi Blocks are pieces of these broken barriers. Those who travel between worlds are advised to avoid meddling in the affairs of other worlds and informing their inhabitants of the existence of other worlds. In order to maintain a balance of separation, several characters, notably Sora, Donald, and Goofy, magically alter their physical appearances in certain worlds to avoid standing out. For example, they take the forms of sea creatures in Atlantica, monsters in Halloween Town, jungle animals in Pride Lands, and computer A.I.s in Space Paranoids and The Grid. Aqua in the Ocean Between. The Ocean Between, also known as the "ocean of stars/interspace" (星の大海, Hoshi no Taikai?) and "sea between worlds/Other Sky" (異空の海, Ikū no Umi?, lit. "Sea of Other Skies"), is a vast space between the worlds. It is threaded by the Gummi routes and lanes between, which serve as paths between worlds for those with the knowledge to use them. Gummi Ships allow travel between most worlds. Travel between the worlds is normally impossible since the worlds are all protected by dimensional barriers that prevent outsiders from entering for the most part. However, these barriers can be broken, resulting in a meteor shower in that world. In Kingdom Hearts and Kingdom Hearts II, Sora, Donald, and Goofy use the Gummi Ship to travel between worlds on the World Map, an event that serves as a mini-game between areas. Some worlds require certain special Gummi Blocks to access; for example, a special Navigation Gummi must be installed by Cid to unlock a second set of worlds in Kingdom Hearts. Once they reach them, the party can enter and then depart each world through its Save Points. In Kingdom Hearts Chain of Memories, there are no Gummi Ships; the worlds Sora visits are recreations from his memories from the first game brought to life on each floor of Castle Oblivion. Timeless River via the Hall of the Cornerstone at Disney Castle. Space Paranoids via Ansem's computer in Hollow Bastion/Radiant Garden. The Final World and Scala ad Caelum via portals in Keyblade Graveyard. There are currently five known ways to travel between the worlds. The Lanes between (異空の回廊, Ikū no Kairō?, lit. "Corridors of the Skies") are a series of "roads" between the worlds in Kingdom Hearts Birth by Sleep that were unlocked by Eraqus. Ventus, Aqua, and Terra frequently use these paths to navigate the worlds. The presence of Darkness is very strong within them, forcing travelers to wear their Keyblade Armor as a safety precaution. To enter the Lanes, the Keyblade wielder raises his or her Keyblade to the sky, and creates a portal leading into the Lanes, appearing somewhat similar to the Dark Corridors. Upon opening the way, they usually call their "Keyblade Glider" and use it to enter. The Lanes resemble the Corridors of Darkness, but with a color scheme closely resembling the Aurora Borealis. Some very powerful Keyblade wielders, such as the Foretellers, have the ability to create portals to the lanes between without the use of a Keyblade. The Corridors of Darkness (闇の回廊, Yami no Kairō?) are pathways that interlink the various worlds, as well as connecting the Realm of Darkness and Realm Between to the Realm of Light. They may only be opened by those who have given themselves over to darkness, but can be used by almost anyone once opened. The Heartless and Nobodies are attempting to link their own Corridors to the gates. Corridors of Darkness also occasionally form spontaneously within the Realm Between, often when a world is destroyed and its surviving inhabitants are cast away to worlds like Traverse Town. While nearly anyone can use the Corridors, frequent use will erode one's body, so those who rely on the Corridors, such as Organization XIII, wear black coats to protect themselves. Those without the coats can survive occasional exposure to the Corridors' darkness if their hearts are strong enough. Pieces of Gummi known as "Star Shards", or the Gummi Ships built from them, are able to travel the Ocean Between. Using Gummi Ships is much easier, as single Star Shards will cause random jumps if their handler isn't skilled in their use. The Gates (ゲート, Gēto?) are pathways that allow their users to travel between worlds despite the presence of the otherwise impassable walls between them, making them similar to the lanes between. The first Gate known to be used, leading to the Land of Departure, was opened by the Wayward Wind after Aqua rescued Ventus's comatose body. Kingdom Hearts Birth by Sleep When the Heartless first began destroying the walls between worlds, the holes these produced made it possible for anyone to travel without the assistance of Keyblade wielders, and the man-made Gates became unnecessary. After Sora's failed Mark of Mastery exam, he travels to Olympus alongside Donald and Goofy by opening a Gate simply by using his Keyblade, without an item triggering it. Twilight Town: The blue orb from the Struggle Trophy. Hollow Bastion: The Hollow Bastion Restoration Committee honorary membership card given to Sora by Leon. The Land of Dragons: Shan-Yu's sword. Olympus Coliseum: The Olympus Stone. Disney Castle: The Cornerstone of Light. Port Royal: Jack Sparrow's compass. Agrabah: A ruby from the Cave of Wonders. Halloween Town: Jack Skellington's Santa Claus costume. Pride Lands: Mufasa's cloud apparition. Realm of Darkness: The sea-salt ice cream given to Sora by Riku. Certain sorcerers, such as Merlin, are able to instantaneously teleport themselves between worlds, apparently without using other methods. Merlin and Yen Sid are also able to open passages to past versions of a world, allowing travelers to move through both space and time. Star of Destiny Islands fading out. In the Kingdom Hearts games, each Star is a specific world. Should a star stop shining, that would mean that particular world has disappeared from existence, most likely from destruction by the Heartless. In Kingdom Hearts, many stars disappeared. In Mickey's first letter to Donald, Mickey mentions the fact that the stars have been disappearing, one by one, and that he left to find the cause. When Donald and Goofy first arrived at Traverse Town, they discovered a star corresponding Destiny Islands fade out of existence. Some of them were restored after Sora and his friends stopped Ansem's plan to plunge the world into darkness, but others remained submerged in sleep as part of the Sleeping Worlds. In Kingdom Hearts II, Mufasa implies that there are stars to represent certain individuals as well, such as when he told young Simba that all the great kings of the Pride Lands are looking at them in the form of stars. Years later, Simba tries to reach out to his deceased father, and he appears to him immediately. The same implication happens in Kingdom Hearts Birth by Sleep, when Master Yen Sid detects that "Eraqus's star has blinked out," after he was struck down by Master Xehanort. The Realm of Light (光の世界, Hikari no Sekai?) is the portion of the universe with an affinity for light, and is positioned opposite the Realm of Darkness. Like the Realm of Darkness, the Realm of Light has a Keyblade, the Kingdom Key, which chose Sora as its wielder. The Realm of Light is the primary setting for the series, although the protagonists sometimes travel to the Realm of Darkness, the Realm Between that connects them, or the Sleeping Worlds that lie parallel to them all. Sora and Riku in front of the Door To Light. The Realm of Darkness appears as a world in Kingdom Hearts Birth by Sleep Final Mix. The Realm of Darkness (闇の世界, Yami no Sekai?) is a realm that lies opposite the Realm of Light. There are few people who have lived or are living here, such as Aqua, Ansem the Wise, and Riku, and it is instead inhabited by the Heartless and other dark beings. The only known Keyblade of the Realm of Darkness is the Kingdom Key D, wielded by Mickey. The Kingdom Hearts of Worlds' Hearts began growing in the Realm of Darkness after the Heartless plague was unleashed on the Realm of Light. "Door to Darkness" redirects here. You may have been looking for the manga chapter. The Realm Between (狭間の世界, Hazama no Sekai?) is the third realm in the Kingdom Hearts series, and lies on the boundary between the Realms of Light and Darkness. Few worlds exist within it, and most have some special nature or purpose. As of now, Traverse Town, Land of Departure/Castle Oblivion, Twilight Town, Mysterious Tower, and The World That Never Was are the only worlds confirmed to exist within the Realm Between. Each world ties closer to the Realm of Light or the Realm of Darkness, with the exception of Twilight Town, which exists exactly in the middle. The Sleeping Worlds (夢見る世界, Yumemiru Sekai?, lit. "Dreaming Worlds") are worlds submerged in sleep. They were created following the defeat of Ansem, Seeker of Darkness, as a portion of the worlds that were attacked by the Heartless remain submerged in sleep. 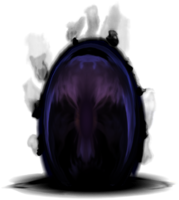 Because this created barriers not even the Heartless could penetrate, darkness took a new form in the Sleeping Worlds, known as the Dream Eaters. 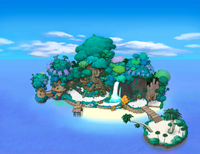 Destiny Islands, the first world seen in the Kingdom Hearts series. A world (世界, Sekai?) is a location that appears in the Kingdom Hearts series. Serving as the "levels" for the games, Sora and other characters are charged with visiting and protecting them through the course of the series. By defending the worlds from the Heartless, Nobodies, or other enemies, Sora keeps the darkness from spreading and the worlds from being manipulated or destroyed. At the end of every world, Sora, Donald, and Goofy have to fight a boss of that world (which is either a giant Heartless or a Disney villain), which opens the Keyhole area when defeated. At the end, Sora locks the Keyhole and earns a Gummi that will let him go to the next world. Each world that appears in the Kingdom Hearts series has its own distinct look and are reminiscent to the films and cartoons they are based on. Oftentimes, the plot of the game in that world will be based on its original source. Almost all worlds can be visited in the course of the game and are part of the playthrough; there are exceptions, though, since some places can be seen in cinematics, but not actually accessed by Sora's party. All worlds are separate from one another, and with a few exceptions, most people are unaware of the existence of other worlds. Deep Jungle from Tarzan. This world made only one appearance in the entire series due to copyright issues. There are over thirty worlds that have appeared in the Kingdom Hearts series so far. Most of them are based on Disney's animated features and contain locations and characters from or inspired by the films. As a result, worlds are greatly varied in appearance, style, and nature, as their sources range from the oldest cartoons created by Disney to more current films in the Disney canon. The oldest source is the 1928 cartoon Steamboat Willie, used as a basis for Timeless River, while the most recent inspiration for a world from Disney's animated features is 2014's Big Hero 6. In Kingdom Hearts II, two live-action films, Pirates of the Caribbean: The Curse of the Black Pearl and Tron, served as the foundation for the worlds Port Royal and Space Paranoids, respectively, while Kingdom Hearts 3D: Dream Drop Distance included "The Grid" based on the live-action film TRON: Legacy. In addition to the Disney-based worlds, twelve original settings were created by game developers Square-Enix as worlds unique to the Kingdom Hearts series. They tend to be populated by Square-Enix characters from the Final Fantasy series, as well as Disney characters without a world dedicated to their film, or original characters created solely for Kingdom Hearts. The world map in Kingdom Hearts. The world map in Sora's story in Kingdom Hearts Chain of Memories. The world map in Reverse/Rebirth mode in Kingdom Hearts Chain of Memories. The world map in Kingdom Hearts 358/2 Days. The world map in Kingdom Hearts II. The world map in Kingdom Hearts Birth by Sleep. The world map in Kingdom Hearts Re:coded. ↑ Xehanort's Report II: "The World is vast—and the worlds within the greater World, uncountable. Like little islands, they dot a great Ocean Between which keeps them ignorant of each other, uncorrupted." ↑ Kingdom Hearts Birth by Sleep Final Mix, Monstro's report entry: "An enormous whale that dwells in the ocean of stars." ↑ Kingdom Hearts, Cid: "Interspace ain't no playground." ↑ Kingdom Hearts 3D: Dream Drop Distance, Prankster's Paradise—Side:Sora: "After this, Pinocchio and Jiminy's world gets dragged into darkness, and they end up cast into the sea between worlds, along with Monstro." ↑ Kingdom Hearts: The Novel, Ansem's Report 11: "I have chosen a particular girl to send off into the Other Sky and observe." ↑ Director's Secret Report XIII p. 26; Tetsuya Nomura: "There are two ways to travel, one of which is to use a Gummi Ship like Sora and his friends do to move through the "Ocean Between", the space studded with all the worlds." Translation via Goldpanner. ↑ Secret Ansem's Report 6: "With this new power, I uncovered a 'corridor of darkness' that connects the realm of nothingness to the outside world. While it is still difficult to come and go as I please, my banishment is now a thing of the past." ↑ Xehanort's Report V: "At present, the lanes and corridors that run between the worlds may only be traversed by us Keyblade wielders, and those who have given themselves over to darkness." ↑ Secret Ansem's Report 11: "It seems my friend, fighting in the realm of darkness, appeared in Castle Oblivion through a corridor of darkness constructed by Organization XIII. My new ally Riku also effected his return via one of these corridors." ↑ 10.0 10.1 Kingdom Hearts II, Yen Sid: "They may be attempting to link these dark pathways to the gates between the worlds." ↑ Secret Ansem's Report 11: "This 'realm between' is quite unstable, with corridors of darkness appearing from time to time. Whenever a world disappears, some of its inhabitants must arrive here through these corridors. Surely Sora traveled these same corridors of darkness when he first came to Traverse Town." ↑ Kingdom Hearts, Maleficent: "It was reckless to bring her here without at least using a vessel. Remember, relying too heavily on the dark powers could cost you your heart." ↑ Director's Secret Report XIII, p. 26; Tetsuya Nomura: "The other way is to use a "corridor of darkness". These routes are like a loophole of sorts and not pathways that should rightfully be used. While only those known as beings of darkness and beings of between are able to create entries and exits, in rare cases even other kinds of beings such as the Beast and DiZ, who held strong sentiment or hatred in their hearts, have been able to open a path themselves. However, this means being near the darkness. Make frequent use of the pathways and the darkness will completely erode one's body. Sora and his friends have also used these pathways a handful of times, but you could consider that the effect of passing through a corridor of darkness is influenced by the strength of one's heart, and as such they have not used them to the degree of frequency that their hearts could have been stained by darkness. In which case, why hasn't erosion by darkness progressed in the heart-lacking Nobodies, King Mickey or Riku, despite them having used the pathways frequently? There is a secret relating to a feature they all share, explained in this very title." Translation via Goldpanner. ↑ Ansem's Report 11: "Opening the door to a world's heart causes its walls to crumble. These fragments are seen as shooting stars. This explains why these "gummi blocks" can travel freely to other worlds." ↑ Kingdom Hearts II, Goofy: "He's Donald's uncle—a business typhoon! Before the Heartless showed up, he traveled the worlds on a Gummi Ship with the King. He was helpin' to set up a traffic system." ↑ Kingdom Hearts, Yuffie: "Before all this, you didn't know about the other worlds, right?" / Aerith: "Because every world was isolated. Impassable walls divided them." / Yuffie: "The Heartless destroyed those walls. But if the worlds return, so will the walls." / Leon: "Which means gummi ships will be useless." ↑ Kingdom Hearts II, Yen Sid: "Because of your previous endeavors, the worlds have returned to their original states. That means the pathways between them have disappeared." / Donald Duck: "How do we get around?" / Yen Sid: "Do not fear. If what the King suspected proves true, the worlds have prepared new pathways along which you may travel. These pathways may be utilized by unlocking special gates. How these gates are opened, I'm afraid I do not know... However, the Keyblade will serve as your guide. When a beam of light radiates from the Keyblade, return to the Gummi Ship. Though the worlds may seem far apart and out of reach, they nonetheless remain connected by invisible ties. As do our hearts." ↑ Kingdom Hearts 0.2 Birth by Sleep -A fragmentary passage-, Goofy and Donald: "It's a gate!" ↑ Kingdom Hearts Birth by Sleep, Yen Sid: "Aqua, the stars bring me grave news. Master Eraqus's star has blinked out. I am afraid that means he has been struck down." ↑ Kingdom Hearts II, Mickey Mouse: "Well, the Door To Darkness can only be opened by the seven princesses." ↑ Kingdom Hearts 0.2 Birth by Sleep -A fragmentary passage-, Mickey Mouse: "The door between the two realms—it won't let a heart with light pass through. So only darkness keeps spilling out." ↑ Secret Ansem's Report 11: "Like Castle Oblivion, that village [Traverse Town] also rests in the cleft between light and dark. ↑ Kingdom Hearts Birth by Sleep Ultimania "[Land of Departure] It is a special place between the realms of darkness and light, and has been protected for generations so that it is not used for evil. ↑ 24.0 24.1 Director's Secret Report XIII, p. 26; Tetsuya Nomura: "Regarding the Realm Between, four worlds have appeared so far: (A) Castle Oblivion, (B) Twilight Town, (C) Yen Sid's Tower, and (D) The World That Never Was. You can think of them as arranged like a stairway extending between the two Realm layers, something like Light < C < B > A > D > Darkness." Translation via Goldpanner.